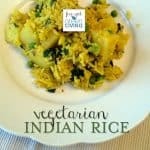 Looking for a meatless Indian dish that isn’t completely spicy? 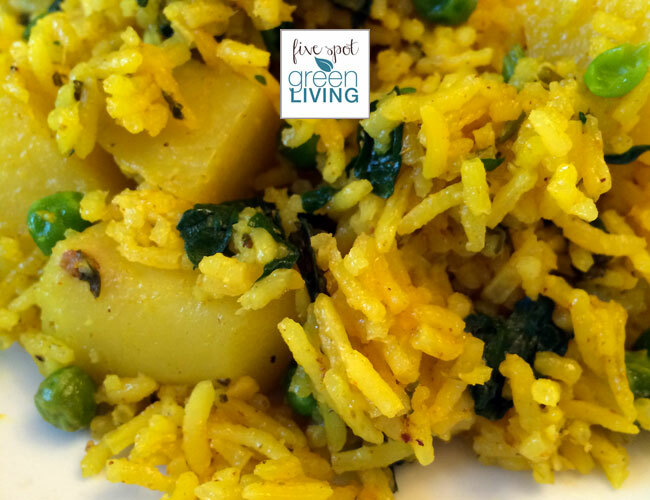 Here is a delicious Vegetarian Indian Rice and Potatoes with peas, spinach and chickpeas. It’s so super easy and fragrant and sure to be a hit tonight! Back in the day, my husband and I used to go to Indian buffet every single Sunday and I loved it! There’s nothing like authentic Indian food on a lazy Sunday. This, of course, was before kids. This was when we had the luxury to have a leisurely lunch in the city, when the most pressing responsibility on the weekend was getting laundry done. But, of course, now I wouldn’t change anything but I can think sweetly back to those days with friends over a steaming chicken korma and the most perfectly cooked basmati rice. Since then, I am always trying to find Indian recipes I can make at home. I found this recipe a few weeks ago and immediately wanted to try it. 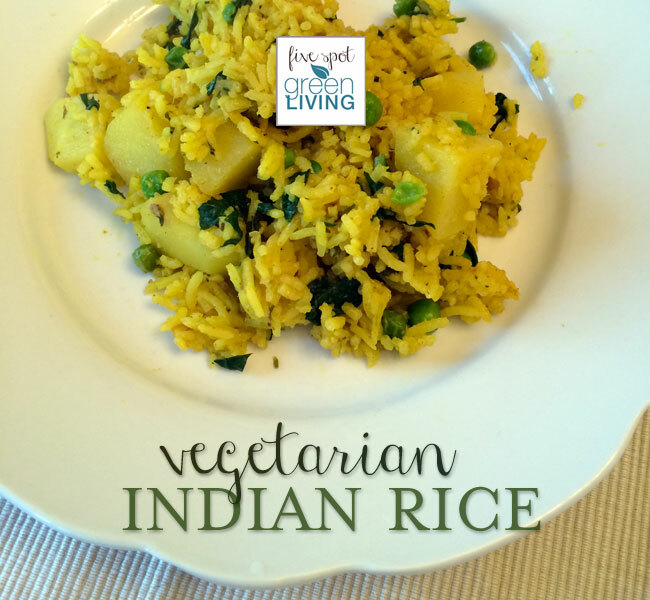 I was a little unsure about pairing rice AND potatoes, but once I added the other ingredients which included peas, spinach and chickpeas, it felt a lot more rounded out. It isn’t too spicy but can definitely be adjusted for people who like spicier food. This is one of those healthy recipes I will keep and make again! Combine yogurt, cilantro, ginger and garlic. Add potatoes, stir well, and allow to marinate for a few minutes. 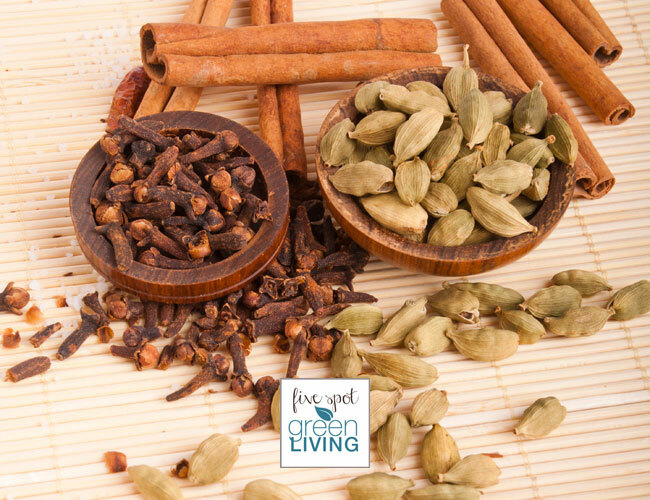 Heat oil in large pan, and add cloves, cinnamon stick, bay leaf, and cumin seeds. Cook for 1-2 minutes, until cumin turns brown. Add potato and yogurt mixture, and cook for 15 minutes, stirring occasionally. Add turmeric, brown sugar, salt, lime juice, and water. Bring to a boil, cover with lid, and lower heat to a simmer. Add cayenne pepper, if desired. I’ve never brined anything in my life, but it actually looks pretty simple with these directions. I think I may have already linked this recipe but it’s sooooo good. Believe it or not I have never had Indian food before. But my husband and I being on a very tight budget don’t eat any meat except for the occasional chicken. I love how this sounds, the cilantro to brighten it up as well as the peas. And I have never had rice and potatoes in one dish. I do have a question. Would it make a big difference if I didn’t add the turmeric? That is one spice I don’t have. Thanks! Hi Robin – It won’t kill the dish if you don’t have turmeric, however, turmeric is a really healthy spice. I think it would still taste really yummy without the turmeric – maybe try some curry? This sounds great! I love Indian food. Thank you for sharing.